O my brothers and my sisters, gather around me that I may tell the tale of what happened after the Before-Time, after the Golden Age when the gods walked upon the earth with us. It was said that in the Golden Age Osiris the great-grandson of Ra sat upon the throne of the gods, ruling over the living world as Ra did over the gods. He was the first Pharaoh, and his Queen, Isis, was the first Queen. They ruled for many ages together, for the world was still young and Grandmother Death was not as harsh as she is now. The ancient legend goes on and tells us about the evil Set and how he killed his brother Osiris, it tells how Osiris was resurrected and how his son yielded the throne of the underworld to him and how he became the lord of the dead with his trustful Son at his side as the Guardian of the dead …. But there is another , forgotten , legend…..which tells the true story of what happened after this Golden Age.. It tells the story of the actual events which caused the downfall of the Egyptian Gods and the mighty Egyptian Empire of the mortals. It speaks about the one who is called The Corruptor, how this Corruptor killed his father and how he was punished by Ra for this action. The legend tells about how Ra turned his back on the mortals and how he , thousands of years, later got confronted again with the Corruptor. It tells us about the ignorance of a Pharaoh and the brave but desperate struggle of the people who lived in the lands of Egypt. So come and sit down brothers and sisters and keep the tale I am about to tell in your hearts and give it to others, as I am giving it to you…. This project was well more or less some crazy immature dream to create a feature length movie….and yes i used the AoM TT game to realize it…damn there must be thousands of triggers and scripts to make all the stuff act like its does in the movie and the more to let it al run smoothly and in real time in the Age of Mythology game engine. As this is a hobby design thing for me…i did it exactly as with all my other hobby design stuff……nothing was planned ahead…the story developed as i went along triggering and designing the sets. I often was curious myself what would happen next… The voice actors also did a great job by adding their magic to this 120 minute long movie. Whether you like it or hate it I think we all can agree that this is the first feature length movie ever created with the Age of Mythology game in the world (yes, yes just a little bit braggin here and i will stop right away with it 🙂 … first says ofcourse nothing about the quality). Just see for yourself if you like it or not… and ofcourse I hope you guys & girls enjoy this stuff..
Big thanx to the Voiceactors for helping me with their magic! Big thanx also to all others who helped and supported me! 5 full cinematic scenarios for the AoM TT game (campaign style). High detailed movie sets with personalised location features. Underwater, space and air scenes. Feature length movie (120 minutes long). Download The Corruptor trailer ( Medium 67 mb, 400×300 wmv file). Download The Corruptor trailer ( Large 217 mb, 600×800 wmv file). The Teaser collections gives you some sneak peaks into the movie and shows you also examples of the voice actors and their magic. 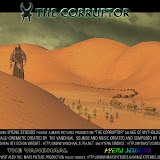 The Corruptor campaign version movie for Age of Mythology the Titans download. Download this Vandhaal joint and enjoy Guys & Girls. The download package contains all you need to enjoy this movie from your AoM TT game: campaign file, scenario files,custom music folder, custom voice acting folder, custom sound effect folder, custom campaign menu overlay images, read me. This Full cinematic AoM TT campaign is downloadable on various locations. There are millions around the Internet. If the above download links do not work for you just message/ post a comment to The Vandhaal. The file has a size of 314 mb. The download package is compressed with winzip. Eh man! Really loved your work when I was much younger. With AoM:EE on Steam, I was curious if there was a way to watch those beauties in their original format? Cheers! Oh silly me! Sorry didn’t bother to scroll down the ‘read-me’ file. Awesome work Vandhaal! Absolute art! Congratutalions!